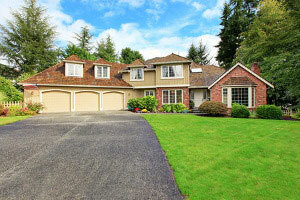 Often overlooked by homeowners, yet essential to the curb appeal of any home is the driveway. It is the first patch of pavement your car traverses on your morning commute, where your kids play basketball, and more often than not where you say goodbye to friends and family. Over time the asphalt that composes your driveway will degrade and may need to be repaired or placed. It is important for any homeowner to know what the signs are that your driveway needs some care, or may need to be replaced altogether. There are a number of factors our expert asphalt assessment team will take into account when looking at your driveway, pipestem, or private road to determine if simple crack filling or sealcoating are the best method of repair, or if the entire thing needs to be replaced. If the pavement has become too fragmented, to the point where crack fill rubber would do little to bind the pieces of asphalt together, an entirely new portion will need to be put down. In this situation, sealcoating and crack filling will do little to alleviate the underlying issues at the base of the driveway, and may only address cosmetic concerns temporarily. Additionally, if our assessment reveals any issues with driveway drainage or water management (driveway is pooling water toward the home foundation, water is unsettling the driveway base etc.) then a new driveway is most likely necessary. Dirt Connections offers a variety of residential asphalt paving services to homeowners in the DC Metro area. The following is a list of just some of the many things Dirt Connections can do for you. We offer the highest quality of service and assessment for every residential asphalt paving need. From your home’s personal driveway, to your neighborhood’s’ whole block, Dirt Connections has the tools to do the big jobs, and the small ones, all with care and attention to detail we have built our reputation on. Need to accommodate a few more cars in the driveway? Tired of having to ease your car down a too narrow driveway? Dirt Connections can help. Our team of experts is ready to consult with you on your driveway uses and needs, and can develop a new paved space that best suites your needs. Sealcoating helps protect your driveway from water damage common during winter months when ice can break up your asphalt. Also, it provides a new driveway look without having to replace your driveway. If your driveway, pipestem, or private road is too damaged to simply repair, Dirt Connections has the tools and the know-how to build you a new one. We take great care to ensure that our completed asphalt paving work is durable, and built to last for years to come. By addressing stressed areas with a fresh coat of asphalt, you can avoid starting from scratch and still improve the functionality and look of your paved spaces. When taking the time to restore or replace your driveway, you want a business partner who will work tirelessly to provide you with the right solution to fit your needs. Dirt Connections has the experience and record of customer service homeowners look for when considering a trusted home improvement partner. Contact Dirt Connections for your free driveway assessment and estimate. 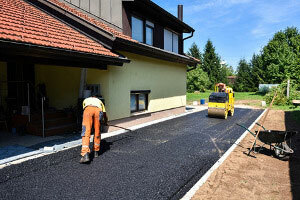 Dirt Connections also offers a host of residential asphalt paving services, such line painting, curbs, and parking lot paving. Contact us today to find out how we can make your dream project a reality!